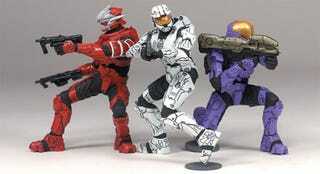 McFarlane keep on releasing Halo figures, and the kids, the kids keep on buying them. Latest products to roll off the money-printing machine include some more Master Chief/Spartan variants, a range of 2.5" figures that come in three-packs (for hot desktop Red v Blue action) and a deluxe 8" Hunter figure, complete with intricate, wormy neck detailing. IN STORES JANUARY 2009 'HALO' 2009, WAVE 1 - EQUIPMENT EDITION 5-inch scale figures with off-the-charts detail and articulation * Master Chief (with rocket launcher and bubble shield) * Elite Combat - Tan (with carbine rifle and gravity lift) * Spartan Soldier EOD - Red (with dual SMGs and trip mine) * Spartan Soldier Security - Olive (with dual maulers and radar jammer) * Spartan Soldier Security - Steel (Game Stop UK and Target Australia Exclusive with dual SMGs and trip mine) * Spartan Scout - Orange (with shotgun and radar jammer) * Spartan Hayabusa - Pink (with shotgun and radar jammer) * Spartan Hayabusa - Blue (with dual maulers and power drainer) * PHOTO TO COME: Arbiter - Active Camo (with plasma sword and bubble shield) 'HALO' HEROIC COLLECTION 2009, WAVE 1 Halo 3 favorites in an all-new size. Three 2.5-inch figures per package to collect and trade. Red Team * Mark VI (with assault rifle) * Mark VI (with battle rifle) * Mark VI (with dual magnums) Blue Team * Mark VI (with assault rifle) * Mark VI (with battle rifle) * Mark VI (with dual spike rifles) Lone Wolves Pack 1 * EOD - Steel (with assault rifle) * Rogue - Olive (with carbine rifle) * Mark VI - Blue (with dual magnums) Lone Wolves Pack 2 * Mark VI - White (with battle rifle) * EVA - Violet (with Spartan laser) * Hayabusa - Red (with dual SMGs) IN STORES FEBRUARY 2009 'HALO' HUNTER DELUXE ACTION FIGURE In scale with our 5-inch Halo 3 figures, the Hunter stands more than 8 inches tall and has more than 28 moving parts. *Figure release dates, lineups and weapons are subject to change.